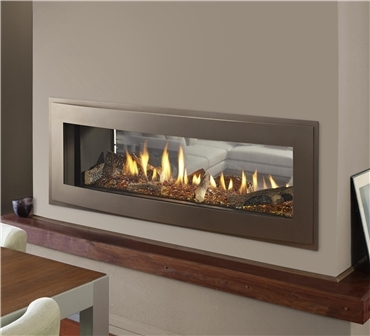 Heatilator Crave 48" see-through gas fireplace with Illusion front and amber glass media. 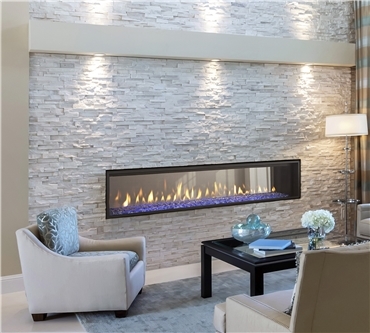 Heatilator Crave 72" see-through gas fireplace with clean face trim and blue glass media. The Heatilator Crave See-Through direct vent gas fireplace comes with Heatilator's IntelliFire Plus RC300 full-featured remote control to allow you to control your flame presentation, activate a timer and/or thermostat mode, and much more! You can further customize your Crave See-Through with your choice of glass media in five different colours, and your choice of three different stylish and modern fronts. Your Heatilator Crave See-Through direct vent gas fireplace comes in your choice of 36", 48", 60", and 72" widths to fit your hearth application. Use the form below to request more information on Crave See-Through, and a Kastle sales rep will get back to you as soon as possible. Fields in red are required.